Kalsytech® offers calcium in its most natural, organic, nutritious form made of pure marine calcium derived from the bones of fish that live only in the pristine waters of New Zealand. New Zealand’s Best Has What Is Missing In Your Animal’s Diet! New Zealand’s Best knows animals and has a superior supplement line to help your animals stay at their very best! There are a variety of reasons why your animals may need additional calcium, such as diet, performance levels, or aging. To ensure your animals have a sufficient level of calcium for bone health, a quality supplement like Kalsytech® may be necessary. For a calcium supplement to be beneficial, it must be easy for the body to digest and retain. Kalsytech® offers calcium in its most natural, organic, nutritious form made of pure marine calcium derived from the bones of fish that live only in the pristine waters of New Zealand. Kalsytech® is 100% microcrystalline hydroxyapatite calcium, which is absorbed well by the body. How Do I Know If My Horse Can Benefit From Kalsytech®? Calcium is an essential mineral often lacking in a horse’s diet. The body uses calcium to build stronger, denser bones early in life, and to keep bones strong and healthy later in life. Calcium is also involved in proper functioning of the nervous system, muscles, heart, and blood clotting. Some horses feed on grasses and food that are known to deplete calcium from their bodies. Horses participating in performance events can also deplete their bodies of much needed nutrients like calcium. In addition, pregnant and lactating mares, growing horses, and performance horses that sweat heavily need higher levels of calcium. To ensure horses have a sufficient level of calcium for healthy bones and teeth, they may benefit from use of a calcium supplement. What Symptoms Might Be Apparent If My Horse Is Low In Calcium? If horses have calcium deficient diets, or graze pastures with calcium deficient grasses (such as kikuyu, buffel, pangola, para or other tropical grasses), they may show signs of calcium deficiency like weak and fragile bones, lameness, weight loss, loose teeth, swollen upper and/or lower jaw bones or facial bones. A premium, high-quality calcium supplement like Kalsytech® can help manage degenerative joint disease (DJD), big head, shin soreness, bone spurs, spavins, shin splints, fractures, poor hooves, laminitis, imperfect bone formation, poor doers, bone soreness, and bone injury. Note: If your horse has pre-existing medical conditions, or is already taking other supplements and/or prescription medications, please consult with your veterinarian prior to starting Kalsytech®. How Do I Know If My Dog Can Benefit From Canine Kalsytech®? Dogs need calcium in their diets just like people do. Whether your dog is a fussy eater, or an active, high-performance canine, he or she needs this essential mineral to help develop and strengthen bone, and improve bone density. Young dogs and aging dogs may have an even higher need for a calcium supplement. Signs of possible calcium deficiency in dogs include weak bones, fractures, skeletal abnormalities, an unhealthy coat, skin problems and brittle nails. If your dog has pre-existing medical conditions, or is already taking other supplements and/or prescription medications, you should consult with your veterinarian prior to starting Kalsytech®. What Sets Kalsytech® Apart From Other Calcium Supplements? Maybe you have never considered where the calcium in calcium supplements comes from, or perhaps you just assumed that all calcium supplements are the same. You may be surprised to learn that most calcium used in supplements is calcium carbonate which comes from limestone mined from rock quarries. This type of calcium is very difficult for the body to digest, absorb, and use. And, if calcium can’t be absorbed into the body--then it’s not worth taking. The calcium in Kalsytech®, however, is marine calcium which is much easier for the body to utilize. 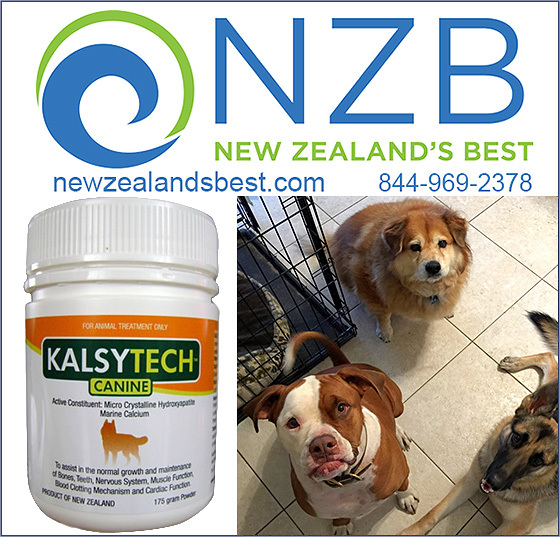 So What Does New Zealand Have To Do With This Kalsytech®? Kalsytech® is made from the bones of fish that live only in the pristine ocean waters of New Zealand. This offers calcium in its most natural, organic, nutritious form. The fish we use are processed using strict standards to maintain the maximum amount of essential nutrients. Bone is hard because it contains hydroxyapatite crystals, which are formed from collagen, calcium, phosphorus, and other minerals. In fact, equine bone is 65% hydroxyapatite, and tooth enamel is almost 90% hydroxyapatite. The calcium in Kalsytech® is 100% microcrystalline hydroxyapatite, which is absorbed well by the body and provides comprehensive bone nourishment because it is formed from actual bone. Is It True That Kalsytech® Is MORE Than Just A “Calcium” Supplement? YES! Kalsytech® is unique because it has calcium combined with other nutrients and minerals to maximize its effectiveness, providing support for healthy bones. Collagen is one of the nutrients in Kalsytech®. It is strong and elastic and is a key component in the development and health of cartilage, ligaments, tendons, bones, fascia and skin. Another mineral in our supplement is magnesium, which is vital for healthy bone structure. It interacts with calcium to keep blood vessels healthy so blood can flow properly, helps muscles contract, and helps regulate electrolytes. Kalsytech® also contains fish bone peptides (FBP’s). FBP’s attract calcium during digestion and promote higher absorption of calcium into the body. The presence of fish bone peptides in calcium supplements increases the solubility of calcium and its bioavailability. By helping the calcium be digested and absorbed better, calcium loss in bones is decreased and calcium retention is increased. (Findings from a study conducted at the Marine Bioprocess Research Center, Pukyong National University, Korea). Another study, conducted by the University of Otago in New Zealand, found that 240 minutes after consumption, 100% of the calcium, 100% of the fish bone peptides, and 60% of the collagen in the Kalsytech® dosage had been transported (absorbed) through the intestinal wall. What Else Makes Kalsytech® So Effective? Another reason Kalsytech® is so effective is that it also contains phosphorus. The ideal ratio of calcium to phosphorus is 2:1. When this ratio is present, maximum absorption of calcium can occur, which means more calcium is available to nourish bones. Kalsytech® has this optimal 2:1 ratio of calcium to phosphorus. Finally, Kalsytech® has no additives and does not contain yeast, dairy, starch, gluten, fillers, wheat, or artificial color. It is manufactured in New Zealand under the strictest quality standards, and is then imported directly to the United States. So--How Long Do I Need To Have My Horse Or Dog On Kalsytech®? If your horse or dog has been diagnosed with a calcium deficiency, or a condition stemming from a calcium deficiency, if he or she is recovering from a fracture, or if a female is in the last trimester of pregnancy, or is nursing, a calcium supplement may be recommended by your veterinarian. In these situations, you should continue giving the calcium supplement until otherwise instructed by your veterinarian. It is important to note that calcium supplements should not be given to puppies or to normal, healthy animals unless specified by your vet. Important Note: In dogs prone to the development of bladder stones, excessive calcium supplementation may increase the likelihood of calcium oxalate stones developing. So, it is smart to consult with a medical professional before adding a calcium supplement to your dog or horse’s diet, making sure to inform him or her of any medications or supplements that your animal may be taking, along with any existing health issues. Order Kalsytech® Today For A Better Tomorrow For Your Horses and Dogs! Starting at only $54 a bottle for dogs and horses— every horse owner can afford to bring the benefits of Kalsytech® home to improve the lives of the animals you love. We are happy to talk to you about your horses and dogs and their unique situations. Just call us or email us today and tell us about your animals!